Londis opened a new shop on the DCU main campus this week and we were lucky enough to make it down for the ribbon cutting and the excitement on campus. 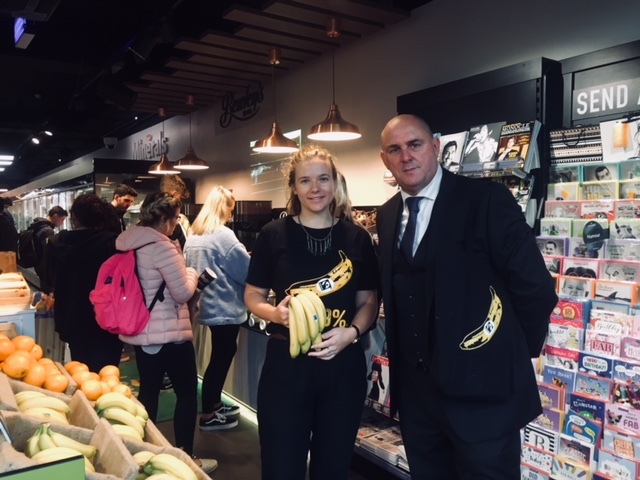 Terry O’Brien, Business Development Manager at Londis, gave us a tour of their innovative retail until at DCU and told us about the numerous sustainability initiatives which include the sale of 100% Fairtrade bananas with Bewley’s Tea & Coffees to go. “This is the shop that the Flower Power generation of the 60s would have designed, but now we have the technology to do so,” he said, fondly noting how sustainability, a hot and important topic now, was formerly a pipe dream but now a reality. The shop is kitted out with top of the line technology and is a “paper and plastic free outlet”. When you first approach the shop, the Londis sign above the door is glowing brightly and is completely solar powered. As you enter the shop immediately to your right are the loose fruit/veg with all Fairtrade bananas and compostable bags (if you choose you need one). A little further in is the Bewley’s coffee and tea dock with self-cleaning machines, 100% Fairtrade coffee and fully compostable cups. Situated on the wall above is a beautiful wall projection of the coffee sustainability journey as produced by Bewley’s. All the prices displayed on the shelves are on Electronic Sensitive Paper with pricing controlled by Wifi, much to the eye’s deception. The fridges holding the cold items for sale have a Global Warming Potential (GWP) of 1, compared to the average GWP output of a household fridge around 120+. “The innovation of this shop reflects the consumers here at DCU who are all conscious of choosing sustainable and Fairtrade products” O’Brien informed us. This shop in DCU marks the beginner of a trend towards fully sustainable shops eliminating plastic and increasing Fairtrade items for sale. A more sustainable future can be created by everyone if we help sustain the livelihoods of the farmers growing our food and reduce our own carbon footprints making us all more conscious consumers.